Can Canaries Eat Fresh Greens? Canaries in the wild eat the best of what's available in their habitat, generally seeds, berries, grains and grasses. When those are sparse, they'll eat a variety of other nutrition sources both flora and fauna. In nature, they spend much of each day flying and foraging for food. Caged canaries, because their exercise is limited, should eat fewer seeds, which are high in fat, and more vegetables. Suitable vegetables for canaries include fresh greens. Fresh greens such as kale, spinach, dandelion greens, broccoli, alfalfa, chickweed, clover, romaine and other dark, leafy lettuces are ideal for adding nutrition to a canary's diet. Generally, the darker green it is the more nutritious it is. 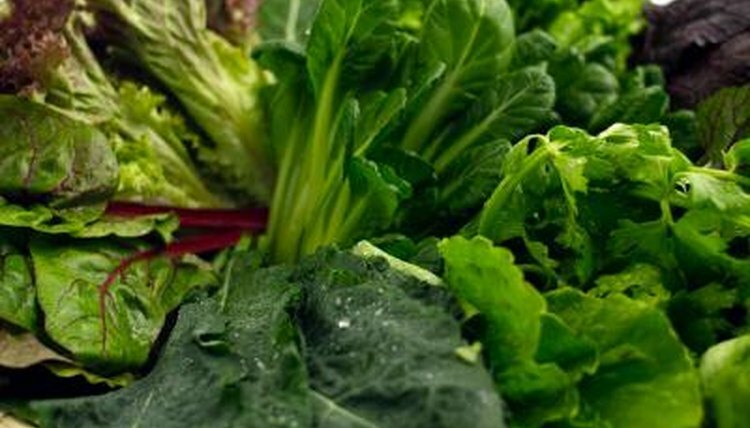 Lighter greens -- such as iceberg lettuce and celery -- provide crunch and water but very little nutrition. Canaries like their fresh greens raw or cooked, and served warm. Avoid overcooking them, as that can remove essential nutrients. Thoroughly wash greens to rid them of pesticides, which are dangerous to canary health. Be sure to wash the folds of lettuce to clean out dirt particles. Peeling the skin isn't necessary; in fact, the skin provides extra nutrients and chewing satisfaction. Chop vegetables into pieces sized for the canary to eat easily. Offer vegetables in a separate food dish, never on top of seeds. Try using a snack or millet clip to attach a vegetable chunk or larger piece of lettuce to a bar of the cage. A canary who's become accustomed to an all-seed diet may balk at first to anything new and different. Offer only one variety at a time. Give the canary a chance to observe it, come closer and eventually try it. Continue to offer the green even if he doesn't try it at first. Once he gets used to seeing it, he's likely to give it a try. Offer a different green next time. Over time, his favorites will become obvious. Continue to offer a variety, however, so he doesn't become stuck on just one or two. Although there are likely to be some he won't care for, soon he'll have an adventurous palate. Don't stop with adding fresh greens. Canaries enjoy many other vegetables, too -- green beans, corn, cabbage, cauliflower, carrots and peas are known to please canaries' palates. Add fruits in smaller amounts, including apples, bananas, grapes and melons. Avoid avocado and the seeds and leaves of fruits, which can be toxic to birds.